The HTD rubber timing belt drive is an advancement on the Imperial trapezoidal toothform, resulting in a more uniform transmission of power when the teeth are in mesh. With better transfer of belt tension to the tension cords, a more uniform distribution of stresses within the tooth profile, the HTD Rubber Belt design results in increased torque transmission. High strength and flexibility allows the use of small pulley diameters, low centre distances and reverse bending idlers. High quality pulleys with pilot bored or taper lock design enable a low-cost, readily available drive setup, with less space requirement. The superb flexural properties of the synchronous drive belt, as well as the exact dimensional mating of the belt and pulley tooth contours, permit drives with an efficiency of 98%. The teeth and the belt top are made from high strength Polychloroprene based elastomer materials. A special manufacturing process ensures an excellent adhesion, both on tensile member and on the facing fabric. Timing belt drives call for a high degree of length stability and tensile strength. 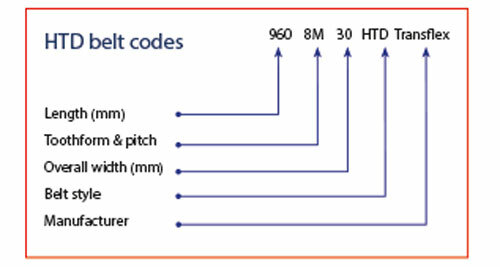 The HTD belts have a low-elongation tensile member of Glass cord helically wound in opposing pairs over the entire belt width. 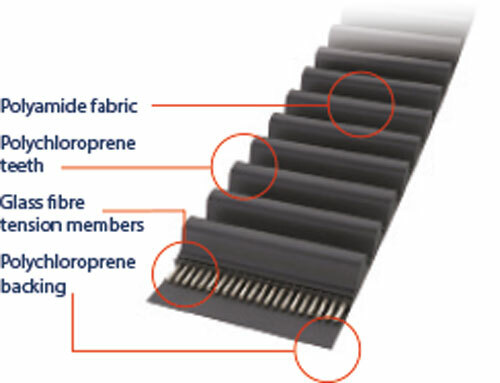 Durable teeth protection is provided with an abrasion-resistant Polyamide fabric, with a low coefficient of friction. With the CONTI® SYNCHROBELT, and Transflex rubber belts TransDev offers TWO brands that together provide even more choice to buyers and users. 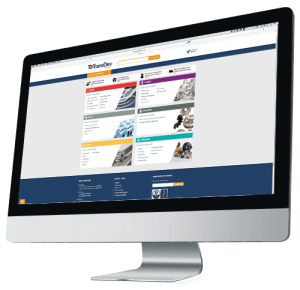 Wherever the application and whatever the budget TransDev has a rubber belt to meet your exact requirements. Premium quality from leading German manufacturer. 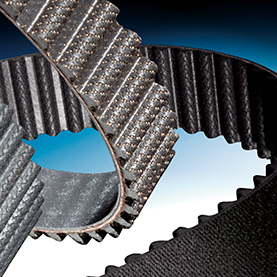 The UK’s largest range of rubber timing belts, providing uncompromising quality and value.